I am thankful for so many things in my life- my church, my family, and my friends are just a few. Though I try to remember my blessings every single day, here in America, this Thursday is a special holiday dedicated to just that- Thanksgiving. 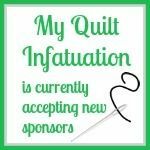 Today, I will be leaving to spend Thanksgiving with my family, so I decided to take the week off from Needle and Thread Thursday. I'll be back next week with all of the highlights from last week's link-up and updates on all of my Christmas gift sewing. I hope you'll join me next week, and if you're here in America, I hope your Thanksgiving holiday is filled with the blessings of family, friends, food, and fun! It's Thursday again, and that means that we've almost made it through another week, and that the weekend is almost here! And it also means that it's time for another Needle and Thread Thursday! I finished up the huge quilt I've been working on, and had to settle for just a few shady pictures. It gets dark so early this time of year- boo! Overall, this quilt is just different enough from Hopscotch that I was able to finish it without getting bored. I always worry about that when I repeat a design or colors close together. 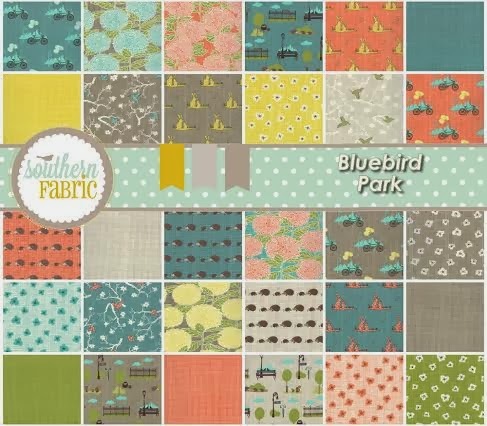 Surprisingly, even though most of the fabrics are the same as Hopscotch, the absence of navy blue, and the extra punches of orange and lime green really give it a much brighter look. I had lots of fun with the backing on this one, and used several one yard cuts along with the scraps, rather than one main backing fabric. One of my students told me that he really liked the green honeycomb print (from Amy Butler's Midwest Modern line) because it looks like turtle shells. That made me smile, and realize that this quilt will suit a little boy perfectly. By the way, that dark spot on the quilt is an acorn that dropped right at the moment I snapped the picture. I used a fun royal blue hexagon print for the binding, and even though I really love it, I forgot to take note of the name of it. There are so many positives about buying from a local shop and playing with all of the pretty fabric in person, but I always find that I forget to pay attention to the fabric line or designer when I'm staring at all of the bolts. ps- it's late November and my roses are still blooming!!! I've decided to name this one Around the Block. I wanted a name that was still playful, but obviously I couldn't name this one Hopscotch as well! I quilted it with a simple meander which, besides the fact that y'all know it's my favorite, is all I'm brave enough to do on a quilt this size. 80x100 inches is doable on a regular machine and totally worth it, but it is a little bit daunting! 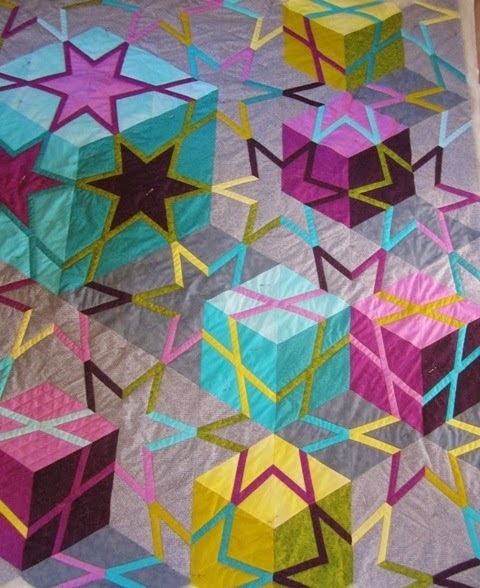 Megan at Tales of Ineptitude revealed her stunning HST star quilt. and Kelsey at Everyday Fray linked up this awesomely manly plus quilt. 2. Link to your specific post to make it easier for others. 3. 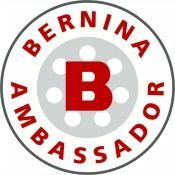 Spread the word and post my button or a text link. I finished the quilt top yesterday for the friend who loved my Hopscotch quilt, but wanted a queen sized one. This one is not exactly the same, but is pretty similar. With a little more orange than Hopscotch and no navy at all, the overall effect is that the quilt is brighter. I like it a lot and I hope they do too! 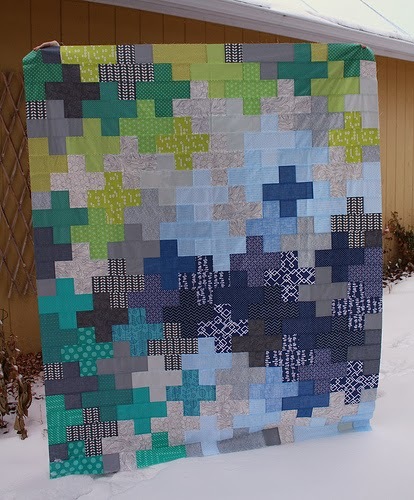 In person, the quilt does actually have a lot of blue in it, but for some reason in the picture, the oranges and greens are really jumping out. I'm working on quilting it right now, and every time I quilt one this big I just feel like I'm drowning in quilt. This one is 80x100. No matter how much table space I have set up, I never feel like it is quite enough. Of course, it's always these big ones that I'm the proudest of. Even still, it feels a little bit weird to do two such similar quilts with so many of the same fabrics back to back. How about you? Do you like to repeat designs or colors or do you always try to do something different each time? Hey y'all! Welcome to the weekend! I have a friend at school that always says that "Fridays are perfectly timed." This week, that could not be more true! Friday came exactly when I needed it the most. I have a fun weekend planned with family and friends, and I might just squeeze in some fabric shopping. You know no weekend is complete without it! That True Colors collection is really calling my name. And oh yeah, their sale section is huge! 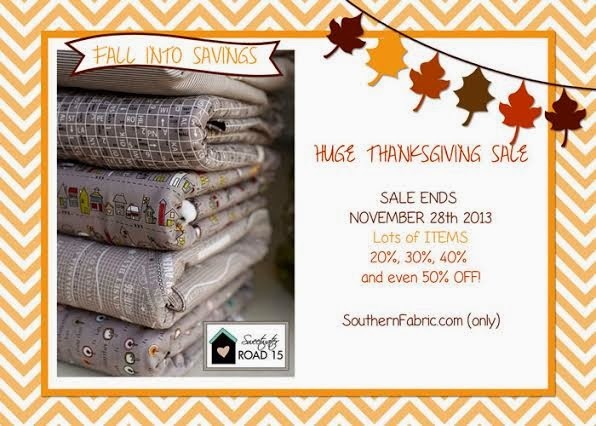 Lots of fabrics, up to 50% off! You've got to hop over and browse their shop and take a look at the special Thanksgiving Sale going on right now! 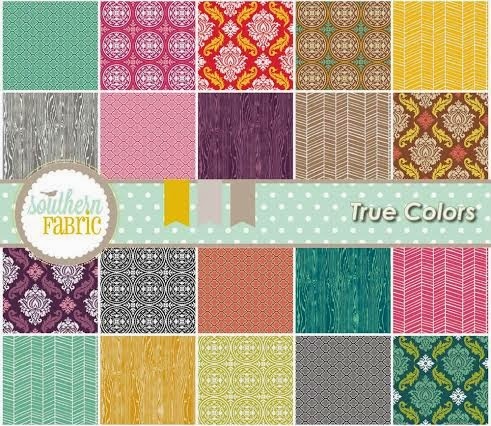 Aubrey at Southern Fabric is offering a $25 gift certificate as a giveaway! All you need to do to enter is check out their site HERE, and let me know what you'd spend it on by leaving a comment. Mr. Random will choose a winner next Friday. Followers get a second entry! *If you're a no-reply blogger or a wordpress user, be sure to leave an email address with your comment so I can contact you! Happy weekend and happy shopping! Edited- Lisa E, comment number 50 is the lucky winner! Lisa, I've sent you an email and forwarded your email address to Aubrey at Southern Fabric! Needle and Thread Thursday- Link Up! Wow, this week has flown by! In fact, I feel like the last couple of weeks have been a whirlwind. This is the week of repetition for me. I don't have any finishes since cranking out 15 tablet sleeves, but I have been plugging away on the mass of Christmas coasters I have to get finished to give as gifts. These are all turned right side out, ready to be quilted. I've been trying to work on those a little bit at a time so I don't get completely sick of them. I'm trying to keep the boredom at bay. It's not that they aren't fun and cute, but 52 (13 sets of 4) of them all at once can get a little mundane. I've also started a new quilt. I don't know what's come over me lately with working on more than one thing simultaneously. I have to admit that it is making me a little bit crazy, but I guess since I don't really want to plow through all those coasters at once, I might as well do something else! Someone I know saw my Hopscotch quilt, and loved it for her little boy. The only thing is, she wants it in a queen size. Although it won't be exactly the same, it will be the same pattern and color palette. Although I have made quilts that are similar to each other before, a complete repeat is new for me. I've managed to get all 80 blocks done (the quilt will be 80x100), and now I just need to press them! They live in my hometown, so I'm planning to get this finished up and ready to deliver when I go home for Thanksgiving. There's nothing like sewing at a leisurely pace, right? ha! Last week, there was lot of quilty eye candy! Check out a few highlights! 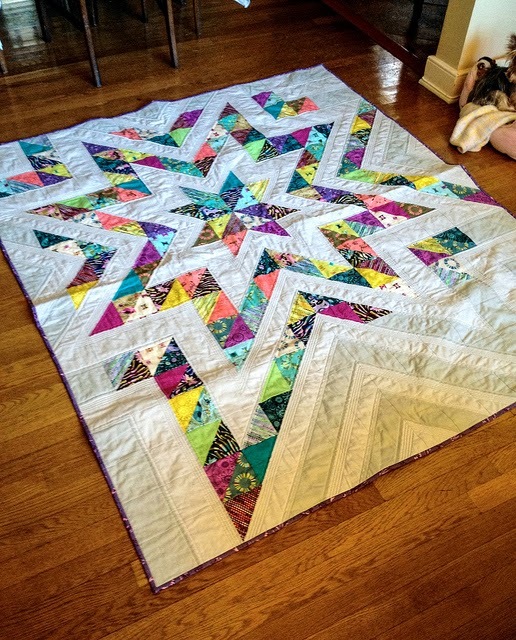 Designs by KC shared this beauty- a hand quilted finish! 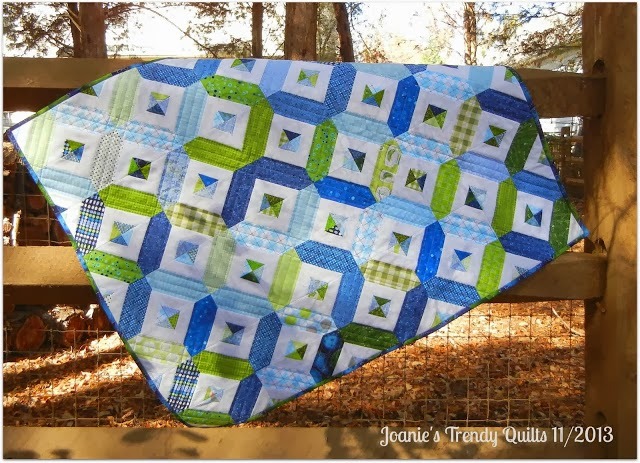 Quilting Gal linked up this gorgeous quilt with such a great illusion! 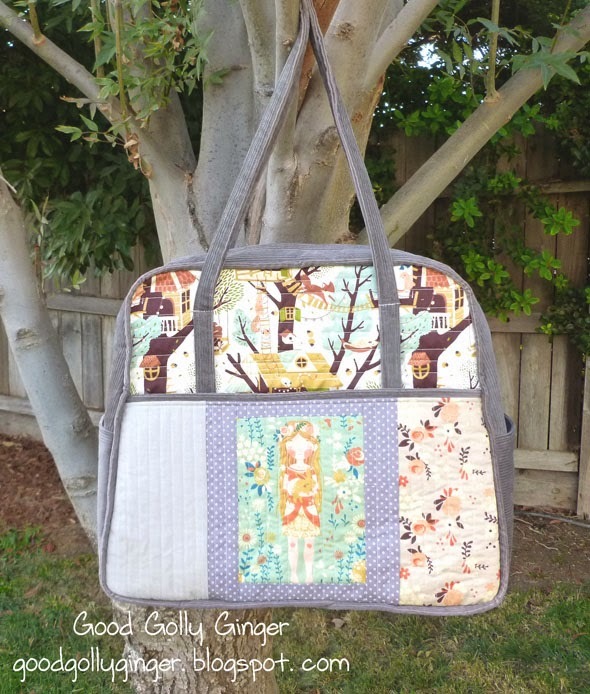 and Good Golly Ginger shared this fantastic Weekender bag! I swear, one day I'm going to make one! 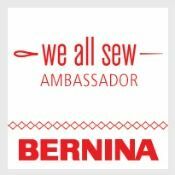 Anyway, what's going on in your sewing space this week? I can't wait to see what you link up! Hey y'all! As promised, here's a tutorial for the simplest, quickest tablet sleeve you will ever see. I love things that are easy, speedy and most of all- cute! You know that I'm not into fancy-schmancy stuff like zippers and pockets, so if I promise it's simple, you can count on it! First of all, let me say that the sleeve I'm making fits a Kindle or an iPad mini (more snugly). It will probably fit other eReaders and small tablets, but since I don't own any others, I can't actually test that out. So, just know that if your tablet is no bigger than an iPad mini- you should be good with these measurements. I've included the directions for calculating the measurements for bigger tablets at the end of the tutorial. *Fabric for the binding- strips- cut 2.5 inches and made into binding. You'll need about 55 inches of binding, so if you're using yardage, you'll need two strips. If you're using fat quarters, you'll need three strips, cut along the longer side. this process step by step with lots of pictures. Have fun with your fabrics! You can go as matchy or as funky as you like! It's lots of fun opening up the sleeve and seeing an unexpected surprise of color in the lining. 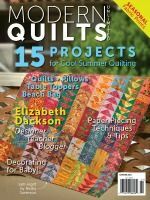 This is also a great use of those fabrics that you love, but never quite make it into a quilt because they're hard to mix with others. *Batting- cut 9x15 inches. This is a great use of scrap batting! Now, just make a tiny little quilt! Lay your lining fabric face down. Add your batting, and your outside fabric and baste. It's so tiny that you don't have to worry about your "backing" fabric wrinkling, and it only takes about 5 pins (one on each corner and one in the center). Next, quilt however you like! Of course, I chose to meander because it's my favorite. For the rest of this process, I use my walking foot. Choose one side to fold over, and add binding to it, sewing to both sides. Don't worry about leaving the raw edges of the binding exposed. Just trim your binding flush with the edge of your quilt. Next, sew velcro just under the binding strip. My velcro is cut into sections about 2 inches long. It's so much easier to sew the velcro on at this point, because once we stitch the sides together, it would get awfully tight! Now take a look at your sleeve. It's really just a little square quilt with part of it doubled over. 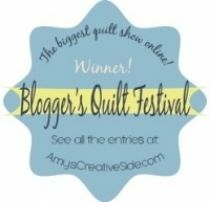 Just add your binding to it as you would any other quilt. Be sure you give yourself plenty of seam allowance so you cover all of your raw edges completely. Here's what it looks like when you attach the binding to one side. It can get a little bit thick where it's doubled, but just take your time, increase your stitch length a little bit, and you'll be just fine! Finally, flip your sleeve over and sew it to the other side. I sew both sides by machine, but let me just say from experience, be careful that you don't pull the binding too far around the front. Remember, sewing the binding further in will make your case more narrow. Pull your binding just past the seam, and you won't make your case too small. Another option would be to add a little width to your fabric, but I really like my cases to fit my devices snugly. The very last step is to sew the other velcro to the closure flap at the top. And, voila! 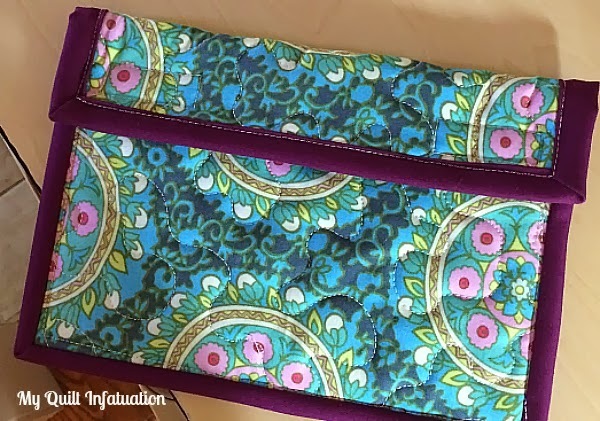 A sweet little tablet sleeve that's the perfect mix of functional and fabulous! Alright, all you full size tablet owners, this part's for you! The construction is the same, but you'll just vary your measurements! 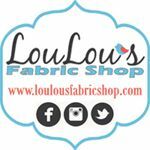 *To determine the proper width of your fabric, measure the long side of your device. Add 1.5 inches to it. 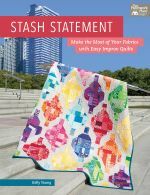 *To determine the proper length of your fabric (the part that will be folded over), measure the short side of your device, double it, and then add five inches. Since your device is bigger, this allows for a closure flap that is slightly bigger (which may also affect velcro placement). Use these measurements to cut your lining fabric, outside fabric, and your batting. *Rather than do all sorts of calculations (unless you're into that sort of thing), just know that three binding strips cut WOF should be long enough to make a case for any tablet. **Edited to add- If you make a sleeve for a tablet, and would like to send me the measurements, I'll be sure to add it here! I hope you give this a try! These are great when you need a quick gift, or if you want to do a little bit of selfish sewing! And there is so much opportunity to change the look just by changing the fabrics! Check out my post HERE to see lots of different ones that I've made. See? Definitely cute, and totally simple! I promise to post the tutorial for the iPad mini/Kindle sleeve tutorial for you soon, but this weekend, I've spent all of my time making several of them. 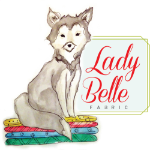 On Saturday, I made my usual Saturday morning run to Bumbletees to ogle all of the pretty fabric and to see if there are any new ones calling my name (you know there always are a few). Andrea happened to be in and saw the Kindle sleeve I made for my wild thing and said they would love to have a few to put in the shop. With the holidays coming up, she thought they would make great gifts. These fit a Kindle or other eReader, and an iPad mini as well! I decided to streamline the process and not piece the outside, but just use one piece of fabric. This really made the process faster and they're still really cute! Here's a run down of all 15 I made this weekend! These were so much fun to make, and they're a great use of fabrics that are pretty, but don't necessarily play well with others. That just happens to me sometimes. I buy a fabric I like, but it never quite makes it into a quilt because it's the one that just doesn't quite go with the rest. Then it just sits in my cabinet- loved, but unused. It's a lot easier to coordinate those fabrics with two others than several others. Plus, with something like this, it's fun when things aren't totally matchy-matchy. Be on the lookout for my tutorial on these! I'll be sure to include calculations for other tablets as well! 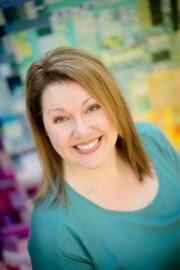 I'm Guest Hosting at Freshly Pieced!